Accessing the cargo area of your pickup can be difficult to do when you're forced to reach awkwardly over the side rails to grab what you need from your truck bed. This is a problem that tailgate steps were designed to solve by providing a strong, safe spot to put your feet down to make it easier to lean into your bed area. 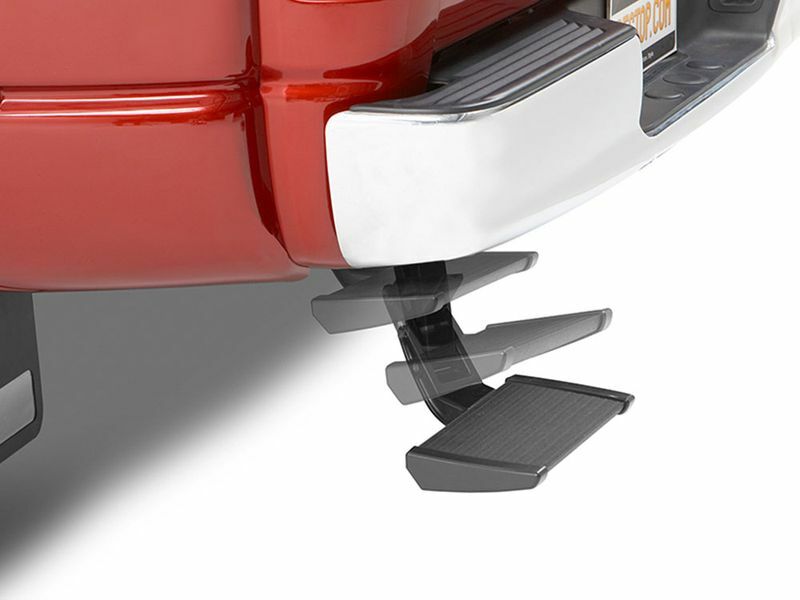 If you're in the market for such a product, the Bestop TrekStep Tailgate Step is an excellent choice. Constructed from high quality aluminum alloy and rated at up to 300lbs of weight capacity, it's as tough and durable as a truck bed step can get. Its step plate is constructed from strong thermo-plastic composite material, ensuring a solid stepping area that can withstand the elements and stomping work boots alike. The Bestop TrekStep Tailgate Step also features simple no-drill installation. It bolts easily into place in under five minutes, so you can spend your time enjoying your truck instead of attaching accessories to it. It also features a convenient retracting design that allows it to easily swing into place when needed and quickly back out of the way. All it takes is a quick foot nudge to put the truck step into the place where you need it, enabling easy, hands-free operation. Thanks to some ingenious design, the Bestop TrekStep Tailgate Step mounts under the rear bumper and swings out the way and out of sight. When it is in use though, its sleek black finish looks great rather than garish, so you can be confident that you won't have to sacrifice your truck's appearances to add functionality. It also will not interfere with any hitch you may also have installed on your ride, so you don't have to worry about losing any towing capability just to install a truck tailgate step. Backed by a 3 Year Warranty, the Bestop TrekStep Tailgate Step is an incredible value that offers convenience, peace of mind, and will take a load off your knees and back. It works great, looks great, and it's definitely one investment in your truck you won't regret if you find yourself frequently reaching into your bed to access cargo, toolboxes, and other things you need.